One stop shop, saving money and time. HARRY POTTER characters, names and related indicia are © & ™ Warner Bros. Entertainment Inc. Harry Potter Publishing Rights © JKR. (s16) ©2016 Universal Studios. All Rights Reserved. 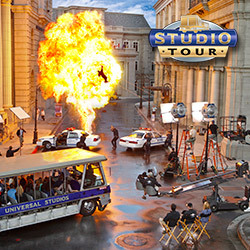 Go behind the scenes of the world-famous Studio Tour to explore real film sets where Hollywood movies are made. Plus, hold on tight for the Studio Tour’s all-new grand finale, Fast & Furious – Supercharged. 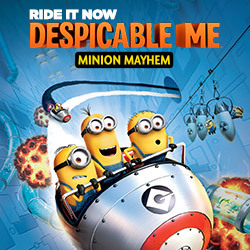 Then, face action head-on in heart-pounding rides, shows and attractions – including Despicable Me Minion Mayhem and TRANSFORMERS™: The Ride-3D – that put you inside some of the world’s most popular TV shows and movies. And from magical spells to magical creatures, from dark villains to daring heroes, it’s all here at The Wizarding World of Harry Potter™, now open at Universal Studios Hollywood. HARRY POTTER characters, names and related indicia are © & ™ Warner Bros. Entertainment Inc. Harry Potter Publishing Rights © JKR. (s16) TRANSFORMERS and all related characters are trademarks of Hasbro and are used with permission. ©2016 Hasbro. All Rights Reserved. ©2016 DreamWorks LLC and Paramount Pictures Corporation. Licensed by Hasbro. ©2016 Universal Studios. All Rights Reserved. The prices on our "Buy Online" site may differ from our In-Store pricing. However, printing your tickets at home may be more convenient for you. Also, some special seasonal tickets (ex: New Year's Eve tickets) may only be available online. Warning: All tickets are date specific, sales are final and cannot be returned, exchanged, nor transferred for any reason. Having trouble printing your E-Tickets? Common Solutions: Please try these solutions before contacting customer service. 1) Turn Pop-up blocker off. Customer Service: This online purchasing site is hosted by Universal Studios HollywoodSM. All sales are final and cannot be exchanged or refunded by Discount Tickets & Tours. All customer service, technical, or upgrade issues that may arise from purchasing on this site must be handled through Universal Studios HollywoodSM. If you have any questions you may email B2BGuestRelations.Relations@nbcuni.com. Please inform the Universal Representative that you purchased on our "consumer website" that is solely operated by Universal Studios. Prices are subject to change without notice and while supplies last. These “Buy Online” Universal Studios Hollywood℠ tickets are valid in California only. Take note of the stated expiration date before purchasing ticket(s). All sales are final and subject to Universal Studios Hollywood℠ ticket policies. Universal Studios HollywoodSM tickets are not transferable nor for resale or rent.